April 24th 1916: What was the Easter Rising? 24 Aibreán 1916: Cad a bhí in Éirí Amach na Cásca? It was a rebellion against British rule in Ireland and was defeated after a swift British military response. As a military campaign the Rising was ultimately a failure but it had an important legacy in that the British response to the event turned the majority of the Irish public away from the idea of Home Rule and towards the concept of a fully independent Irish Republic. Professor Mike Cronin details this pivotal date in Irish history. B’éirí amach a bhí ann i gcoinne riail na Breataine in Éirinn agus buaileadh lucht an éirí amach tar éis don Bhreatain freagairt go tapa le harm. Mar fheachtas míleata theip ar an Éirí Amach ar deireadh, ach d’fhág sé oidhreacht thábhachtach sa mhéid is gur thug go leor de mhuintir na hÉireann a gcúl don smaoineamh maidir le Rialtas Dúchais mar gheall ar fhreagra na Breataine agus chuaigh siad i dtreo an choincheapa go mbeadh Poblacht na hÉireann ann a bheadh go hiomlán neamhspleách. Sonraíonn an tOllamh Mike Cronin an dáta tábhachtach seo i stair na hÉireann. Cén fáth ar theastaigh Éirí Amach? The dominant force in Irish politics through to 1916 was the Irish Parliamentary Party led by John Redmond. The Party fully endorsed the idea of Irish Home Rule, and had successfully managed to get a Home Rule Bill on the Statute Book in 1912. Home Rule was to have been introduced in 1914 but was postponed because of the outbreak of the First World War. Redmond backed Irish participation in the War, and the vast majority supported that decision. A small group of nationalists opposed the idea of Home Rule, as well as Irish participation in the War. The planning of the Rising would be done by a small, radical group in the Irish Republican Brotherhood, and they looked to the Irish Volunteers (a movement that opposed Irish entry into the War and instead dedicated itself to the defence of Ireland) to undertake the military action. There has been much historical debate about why the Rising was planned. In essence it seems that factors such as the rise of the Ulster Volunteer Force and the strength of Unionism on the island, the existence of the Irish Volunteers as an insurrectionary force, and the fact that the War was a distraction for the British authorities combined to make the Rising a possibility. Also, leaders such as Tom Clarke, Sean MacDermott and Patrick Pearse were, at their heart, Republicans who fervently believed in the ideal of an Irish Republic and believed that the use of violence to achieve that goal was acceptable. Ba é Páirtí Parlaiminteach na hÉireann faoi cheannas John Redmond an fórsa ceannasach a bhí i bpolaitíocht na hÉireann suas go dtí 1916. D’fhormhuinigh an Páirtí Rialtas Dúchais na hÉireann go hiomlán, agus d’éirigh leis Bille um Rialtas Dúchais a chur ar Leabhar na Reachtaíochta i 1912. Bhí Rialtas Dúchais le tabhairt isteach i 1914 ach cuireadh ar atráth é nuair a thosaigh an Chéad Chogadh Domhanda. Thug Redmond tacaíocht do rannpháirtíocht na hÉireann sa Chogadh, agus thacaigh móramh mór leis an gcinneadh sin. Chuir grúpa beag náisiúnach i gcoinne an Rialtais Dúchais, chomh maith le rannpháirtíocht na hÉireann sa Chogadh Mór. Ba ghrúpa beag radacach i mBráithreachas Phoblacht na hÉireann a phleanálfadh an Éirí Amach, agus d’fhág siad ag Óglaigh na hÉireann é (gluaiseacht a bhí in aghaidh Éire a bheith páirteach sa Chogadh agus a bhí meáite ina ionad sin ar chosaint na hÉireann) an gníomh míleata a ghlacadh. Is iomaí plé stairiúil atá déanta ar an gcúis gur pleanáladh an tÉirí Amach. Go bunúsach ba chosúil mar gheall ar dhul chun cinn Óglaigh Uladh agus neart an Aontachais ar an oileán, agus Óglaigh na hÉireann a bheith ann mar fhórsa a bhí báúil d’éirí amach, agus toisc go raibh údaráis na Breataine gafa leis an gCogadh, gur fhág na rudaí sin ar fad go bhféadfaí Éirí Amach a chur ar bun anseo. Chomh maith leis sin, ba Phoblachtaigh go smior a bhí i gceannairí cosúil le Tomás Ó Cléirigh, Seán Mac Diarmada agus Pádraig Mac Piarais agus chreid siad go daingean san idéal a bhain le Poblacht na hÉireann agus chreid siad go raibh sé inghlactha foréigean a úsáid chun an sprioc sin a bhaint amach. The Rising was planned by the Military Council of the Irish Republican Brotherhood which featured, among others, Tom Clarke, Sean MacDermott, Patrick Pearse and James Connolly. The force that would come together and fight during the Easter Rising comprised the Irish Volunteers (under the leadership of Pearse), the Irish Citizen Army (led by James Connolly) and the women’s organisation, Cumann na mBan. In total these three groups had approximately 1,600 active participants in the fighting during Easter week. The combined ideologies of the three groups are best encapsulated in the Proclamation of the Irish Republic that was read out at the GPO on Easter Monday. The document brings together the Republicanism of the Irish Volunteers with the socialism of the Irish Citizen Army and the feminism of Cumann na mBan. Ba í Comhairle Mhíleata Bhráithreachas Phoblacht na hÉireann a phleanáil an tÉirí Amach agus ar an gComhairle sin bhí Tomás Ó Cléirigh, Seán Mac Diarmada, Pádraig Mac Piarais agus Séamus Ó Conghaile, i measc daoine eile. I measc an fhórsa a thiocfadh le chéile agus a throidfeadh in Éirí Amach na Cásca bhí Óglaigh na hÉireann (faoi cheannas an Phiarsaigh), Arm Cathartha na hÉireann (faoi cheannas Shéamuis Uí Chonghaile) agus Cumann na mBan. Nuair a bhí na trí ghrúpa sin le chéile, bhí thart ar 1,600 duine ar an iomlán páirteach sa troid i rith Sheachtain na Cásca. Is i bhForógra na Poblachta a léadh amach ag Ard-Oifig an Phoist ar Luan Cásca is fearr a fheicfidh tú idé-eolaíocht na dtrí ghrúpa sin le chéile. Tugtar le chéile sa cháipéis sin Poblachtachas Óglaigh na hÉireann agus sóisialachas Arm Cathartha na hÉireann agus feimineachas Chumann na mBan. The Rising was to have taken place on Easter Sunday. However, the failure of the Germans to land a shipment of weapons on the Kerry coast on Easter Friday called into question whether the Rising could take place. Eoin MacNeill thought not, and issued a countermanding order that was published in the Irish Sunday Independent on Easter Sunday. The more radical voices insisted that the Rising go ahead, even without the German arms, and fresh orders were issued by Pearse that the military plan be activated on Easter Monday. On Monday 24 April, members of the Irish Volunteers, Irish Citizen Army and Cumann na mBan took control of several key buildings across Dublin city centre. While some of these buildings, such as the GPO and Boland’s Mills, would become iconic in the memory of the Rising, there were other key strategic sites that the rebels did not succeed in taking. The failure to control railway stations or the Dublin and Kingstown (Dun Laoghaire) docks meant that when the British needed to move troops into the city in large numbers to quell the Rising they could do so relatively unimpeded. The failure to take the HQ of the British administration, Dublin Castle, and a significant building that was stocked with arms, Trinity College, hampered the rebels. Both locations would be important bases for British forces during the week. The British began pouring troops from across Ireland into the city from Monday afternoon, and from England by the dawn of Wednesday. With thousands of troops in the city the question for the rebels was for how long could they hold out. Some buildings held by the rebels, such as City Hall, fell quickly while others would resist until they formally surrendered on Sunday 29 April. The fighting was fierce, particularly around Mount Street Bridge and North King Street, where the death rate on both sides, and amongst civilians, was highest. Essentially the rebel positions spent the week under siege while they were shot at and had heavy artillery rained down on them. Given their resources the rebels had to largely rely on defending their positions with rifle and sniper fire as well as with improvised explosives. 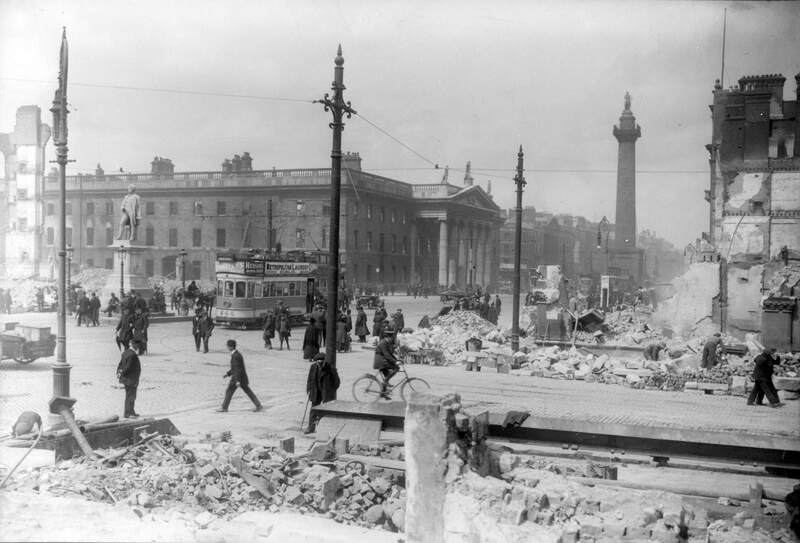 The high levels of artillery used by the British led to a huge number of fires around the Sackville Street area, destroying the buildings of the street and ultimately forcing the rebels in the GPO to evacuate on Friday evening. Once they had left the GPO the Rising was effectively over. Pearse would surrender on Saturday afternoon to avoid any further loss of civilian life. It was civilians who paid the highest price during Easter week. Recent research by the Glasnevin Trust has shown that of the 488 deaths during Easter week, 54% were civilians, 26% were British troops, 16% were rebels and 4% were police. Bhí an tÉirí Amach ceaptha tarlú ar Dhomhnach Cásca. Mar sin féin, toisc gur theip ar na Gearmánaigh lastas armlón a chur i dtír ar chósta Chiarraí ar Aoine an Chéasta bhí amhras faoi cibé an bhféadfadh an tÉirí Amach tarlú in aon chor. Níor cheap Eoin Mac Néill go bhféadfadh, agus d’eisigh sé freasordú a foilsíodh in eagrán na hÉireann den Sunday Independent ar Dhomhnach Cásca. D’áitigh an dream ba radacaí go rachadh an tÉirí Amach ar aghaidh, fiú gan arm na Gearmáine, agus d’eisigh Mac Piarais orduithe nua go gcuirfí an plean míleata i ngníomh ar Luan Cásca. Dé Luain, an 24 Aibreán, ghlac baill d’Óglaigh na hÉireann, d’Arm Cathartha na hÉireann agus de Chumann na mBan smacht ar roinnt foirgnimh thábhachtacha ar fud lár chathair Bhaile Átha Cliath. Cé go mbeadh roinnt de na foirgnimh sin, cosúil le hArd-Oifig an Phoist agus Muilte Uí Bheoláin, aitheanta i gcuimhne na ndaoine ar an Éirí Amach, bhí roinnt láithreáin straitéiseacha eile ann nár éirigh leis na reibiliúnaigh a ghabháil. Toisc gur theip orthu stáisiúin traenach nó dugaí Bhaile Átha Cliath agus Bhaile an Rí (Dún Laoghaire) a chur faoi smacht, bhí na Sasanaigh in ann lear mór trúpaí a bhogadh isteach sa chathair gan stró chun an tÉirí Amach a chur faoi chois. Theip ar na reibiliúnaigh Ceanncheathrú riarachán na Breataine a ghabháil, Caisleán Bhaile Átha Cliath, agus theip orthu chomh maith Coláiste na Tríonóide a ghabháil, foirgneamh suntasach a bhí pacáilte le harm – chuir na rudaí sin go léir srian mór ar na reibiliúnaigh. Ba bhunáiteanna tábhachtacha a bheadh sa dá láthair seo d’fhórsaí na Breataine i rith na seachtaine. Thosaigh an Bhreatain ag seoladh trúpaí ó fud fad na hÉireann isteach sa chathair ó thráthnóna Dé Luain, agus ó Shasana faoi bhreacadh an lae Dé Céadaoin. Bhí na mílte trúpa sa chathair agus ba léir nach fada eile a bheadh na reibiliúnaigh in ann a dtalamh a sheasamh. Thit roinnt foirgneamh a bhí i seilbh na reibiliúnach, cosúil le Halla na Cathrach, tapa go leor agus lean roinnt eile orthu go dtí gur ghéill siad go foirmiúil Dé Domhnaigh, an 29 Aibreán. Bhí an trodaíocht fíochmhar, go háirithe timpeall ar Dhroichead Shráid an Mhóta agus ar Shráid an Rí Thuaidh, áit a raibh an ráta báis ab airde ar an dá thaobh, agus i measc na sibhialtach. Go bunúsach chaith na reibiliúnaigh an tseachtain faoi léigear agus urchair á gcaitheamh leo agus gunnaí móra á n-úsáid ina gcoinne. Mar gheall ar a laghad acmhainní a bhí acu b’éigean do na reibiliúnaigh a bheith á gcosaint féin den chuid ba mhó le raidhfilí agus le naoscairí chomh maith le pléascáin seiftithe. Tharla go leor dóiteán timpeall ar cheantar Shráid Sackville mar gheall ar na gunnaí móra a bhí in úsáid ag na Sasanaigh, agus scriosadh na foirgnimh ar an tsráid sin agus sa deireadh thiar cuireadh iallach ar na reibiliúnaigh in Ard-Oifig an Phoist an foirgneamh a fhágáil tráthnóna Dé hAoine. Nuair a bhí Ard-Oifig an Phoist glanta amach acu ba é sin deireadh an Éirí Amach i ndáiríre. Ghéillfeadh an Piarsach tar éis am dinnéir Dé Sathairn ionas nach bhfaigheadh tuilleadh sibhialtach bás. Ba iad na sibhialtaigh ba mhó a bhí siar le Seachtain na Cásca. Léiríodh i dtaighde a rinne Iontaobhas Ghlas Naíon le déanaí gur shibhialtaigh a bhí i 54% den 488 duine a fuair bás i rith Sheachtain na Cásca, ba thrúpaí na Breataine a bhí i 26% díobh, ba reibiliúnaigh 16% díobh agus ba phóilíní 4% díobh. The legacy of the Easter Rising is complex and, at times, deeply contested. There is no doubt that British actions during Easter week, such as the killings of civilians on North King Street, turned public opinion against Britain. The executions of the rebel leadership and the arrest of over 3,000 people in the wake of the Rising also served to radicalise public opinion. However, the ongoing losses in the Great War and the debate over the introduction of conscription in 1918 also led Irish people to question their relationship with Britain. Generally the British response to the Rising and the wider impact on Ireland of the War served to turn the public away from Redmond’s ideal of Home Rule and towards the more radical Republican rhetoric of Sinn Fein. The spirit of 1916, and the military lessons learnt from it, are central in understanding the Irish insurgency against Britain between 1919 and 1921 and the creation of an independent Irish Free State. The complex legacy of 1916 is clearly seen from this point. The split over the Treaty, which led to the creation of the Irish Free State, would not only lead to Civil War, but also to claims from each side of the Treaty divide to be the true inheritor and custodian of the spirit of 1916. The problematic legacy of 1916 – in effect the question of who was the legitimate guardian of the Proclamation – came to be regarded in some quarters as fanning the flames of the Northern Ireland troubles from 1968. It is a legacy that has been to the fore in debates about how the centenary of the Rising should be celebrated. Among the many questions still asked are whether the Rising was justified in light of the significant political achievements of the Irish Parliamentary Party and whether the Ireland of today is the one that the men and women of 1916 dreamed of. Professor Mike Cronin is Academic Director of Boston College-Ireland. Find out what's happening on April 24th 2016, here. Tá oidhreacht chasta ag baint le hÉirí Amach na Cásca, agus, uaireanta, bíonn conspóid mhór faoi. Níl aon amhras faoi ach gur fhág an méid a rinne an Bhreatain i rith Sheachtain na Cásca, cosúil leis na sibhialtaigh a maraíodh ar Shráid an Rí Thuaidh, go leor den phobal in aghaidh Shasana. Thosaigh tuairimí an phobail ag éirí níos radacaí freisin nuair a cuireadh ceannaireacht na reibiliúnach chun báis agus nuair a gabhadh os cionn 3,000 duine tar éis an Éirí Amach. Mar sin féin, bhí líon na ndaoine a bhí á gcailleadh sa Chogadh Mór agus an díospóireacht maidir le coinscríobh a thabhairt isteach i 1918 ag cruthú amhrais i measc mhuintir na hÉireann maidir lena gcaidreamh leis an mBreatain freisin. Go ginearálta mar gheall ar an gcaoi ar chaith an Bhreatain leis na daoine san Éirí Amach agus mar gheall ar an tionchar níos leithne a bhí ag an gCogadh ar Éirinn thosaigh an pobal ag tabhairt droim láimhe d’idéal Redmond maidir le Rialtas Dúchais agus ag iompú i dtreo reitric Phoblachtach níos radacaí Shinn Féin. Tá spiorad 1916, agus na ceachtanna míleata a foghlaimíodh uaidh, lárnach chun tuiscint a fháil ar cheannairc na hÉireann in aghaidh na Breataine idir 1919 agus 1921 agus ar chruthú Shaorstát Éireann a bhí neamhspleách. Feictear oidhreacht chasta 1916 go soiléir ón bpointe sin. Ní amháin go dtarlódh Cogadh Cathartha mar gheall ar an scoilt de bharr an Chonartha, ar cruthaíodh Saorstát Éireann mar thoradh air, ach freisin chruthófaí éilimh ó gach taobh den scoilt ón gConradh gurb acu a d’fhágfaí agus gurb iad a chaomhnódh i ndáiríre spiorad 1916. Ba ghearr gur breathnaíodh ar oidhreacht achrannach 1916 – go bunúsach an cheist maidir le cérbh iad caomhnóirí dleathacha an Fhorógra – mar rud a chuir dlús agus borradh faoi splanc na dtrioblóidí i dTuaisceart Éireann ó 1968. Is oidhreacht í a bhíonn á cíoradh de shíor i ndíospóireachtaí faoi conas ba cheart comóradh céad bliain an Éirí Amach a cheiliúradh. I measc an iliomad ceist a chuirtear i gcónaí fiafraítear cibé ar cheart don Éirí Amach tarlú in aon chor i bhfianaise na n-éachtaí móra polaitiúla a d’éirigh le Páirtí Parlaiminteach na hÉireann a bhaint amach agus cibé arb í Éire an lae inniu an ceann a bhí de dhíth ar fhir agus ar mhná 1916. Is é an tOllamh Mike Cronin Stiúrthóir Acadúil Boston College-Ireland. Faigh amach cad atá ag tarlú an 24 Aibreán 2016 anseo. Why a Rising?Cén fáth ar theastaigh Éirí Amach?